The Lock markers are rather big and risk to cover counters and zone numbers. My fellow Eric Hanuise proposed to use matches instead of the markers. 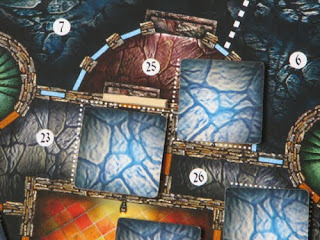 Vinciane on the other hand proposed to use plastic bases from another game. Now, the locks fit better in-between two zones. Zvezda, the publisher of the game, has sculpted very nice figures. Of course, they come unpainted in the box, but look here how expressive they become with a quick brush of colour. 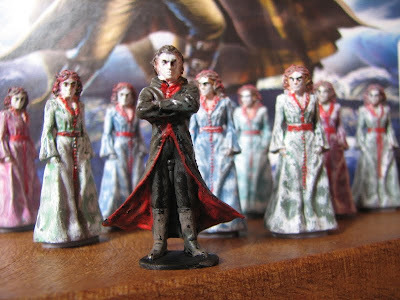 Example : How to paint Dracula in 10 minutes? 1) Use acrylic colours : they dry quickly. 2) Paint first the figure in black. 3) When the colour is dry, add some delicate grey tones with a dry brush in order to lighten up the details. 4) Clean your brush and add red details on his cape. 5) Clean your brush thoroughly and paint his face white and add dark eyebrows (in brown or black). 6) Put some brown on his boots. It's dirty in his castle. 7) If you are as clumsy as me, correct now your mistakes. 8) Stop your stopwatch. You are ready! You have 4 Action points. 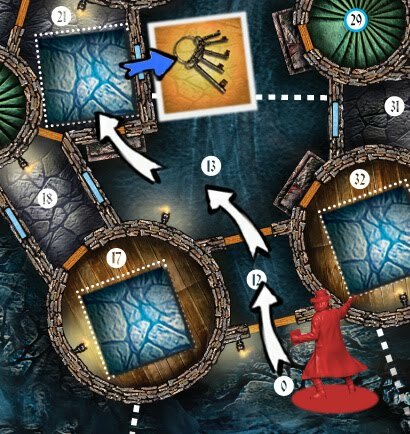 Van Helsing moves 3 times and searches the room. You flip over the marker and find the master keys. Now, you can open any locked door. Dracula has 5 actions points. He moves secretly by noting the arrival dots on a log sheet. Nevertheless, at the start of his turn, he must announce where he is standing. 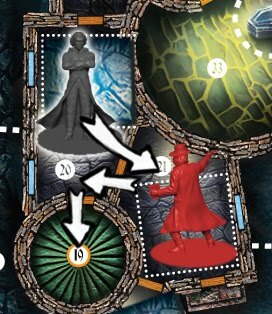 So, the player reveals that Dracula is standing in zone n°20. Dracula enters the room of Van Helsing (1 action). He attacks him twice (2 actions). Then, he moves away to zone n° 19 in order to be hidden again (2 actions). He notes n°19 on his log. Here is a 3D view of the castle of Dracula. The gameboard consists of 3 parts, each part showing one level of the castle. Each zone has a number, which is useful for the vampire player, as he will move secretly (more or less in a similar way as in "Nuns on the run"). 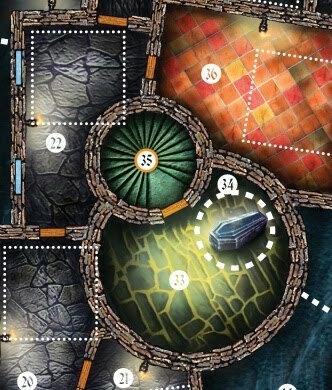 Zone n° 34 indicates the coffin of Dracula. He will start there and he must try to reach it back after finding his brides. You can move from one level to the other by using one of the 5 small towers. The dotted squares indicate the places where object counters will be put down. The characters will be able to pick them up and add them on their sheet. Next: what can you do in your turn? 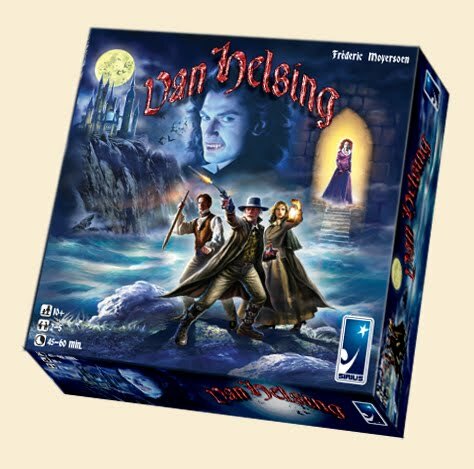 There are 5 characters in the game: Dracula and the 4 hunters : Van Helsing, Mina Murray, Jonathan Harker and Lord Godalming. Each character has one sheet. On this sheet, you see a row with Blood points and a row for objects (bats for Dracula). The Blood points indicate your life points, your action points and the number of objects that you may carry. 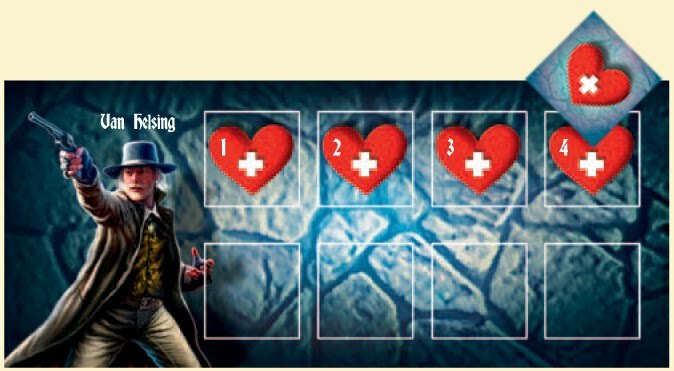 At the start of the game, each character starts at the maximum number of Blood points, which is 4 for the hunters and 5 for Dracula. This is indicated by placing a Blood marker as a diamond on top of the right square. The hunters get 6 initial objects to divide: a crucifix, a dagger, a pistol,a lamp, an antidote and a first aid kit. The first problem emerges: who gets which object(s)? The hunters must find an agreement. The objects are placed facedown on the character sheet. 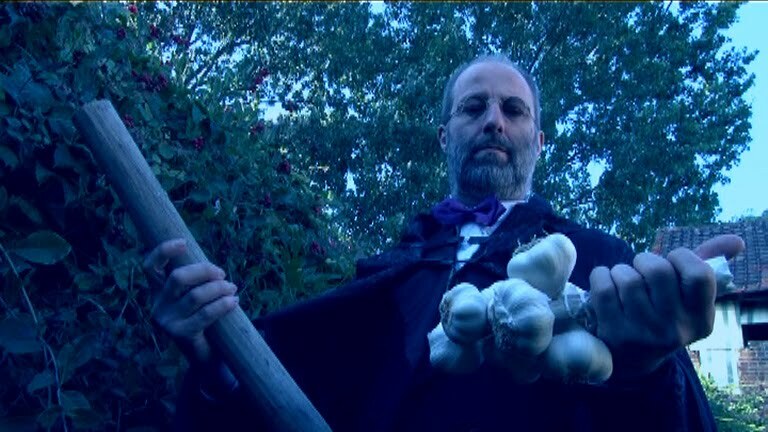 Dracula does not need to know who is carrying which object. The small number on some objects indicate the chance that using the object succeeds. The higher the number the more chance on success. The asterix indicates that the object can only be used once. After use, you must discard the object. Soon : the castle and its 3 levels. Where are these people going to? What will Lord Godalming chose? Where is Mina so scared about? Why is Jonathan Harker holding a rifle? What is this stake for? Soon, you will know the answers by looking at the trailer or by playing the game "Van Helsing"! 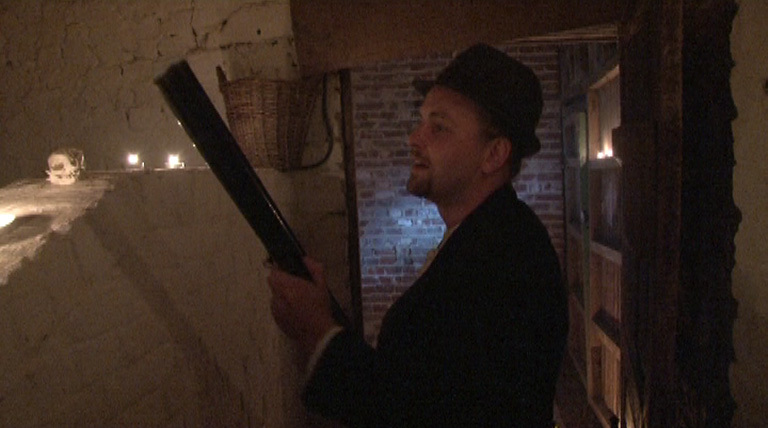 The shooting of the trailer is finished and now I'm busy with the editing. Here is a first picture as a teaser. - The trailer was shot close to Borgo Pass in Roumania. - The actors were selected among the most talented Belgian stars. 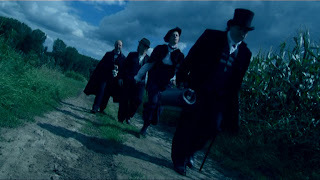 - The crew was the "crème de la crème" of the professional filmmakers. - The original budget was surpassed ten times. - The producer has expended all his savings due to excessive extras, like a private jet for Van Helsing. - The director, which is the same person as the producer, got big family problems as his wife had to clean all the mess at the end of the shooting. - The release of the game is postponed to october in order to allow finishing the editing in time. 1. In the first game-turn, do the novices roll for noise? 2. 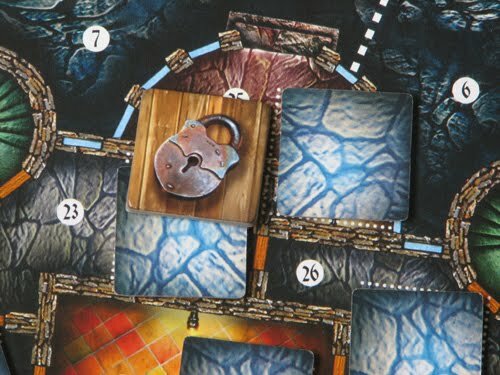 When do the guards have to select their first path cards? 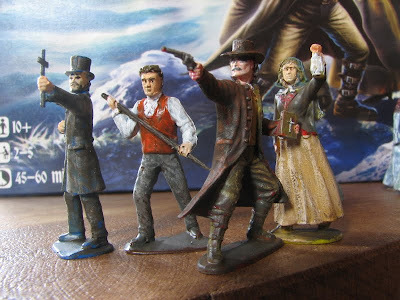 At the start of their game-turn. 3. Can you chose to re-use the same movement card? 4. Do you have to select your movement card before moving? No, you move first and show the movement card in relation to the distance that you have moved. 5. When does a guard turn after or before moving? At the start of each movement step, the guard figure is pivoted in the new direction. 6. Can a guard immediately leave her path and start running after seeing a novice? 7. When I'm caught, when can I disobey and start moving in another direction than my cell? As soon as the guard does not see you anymore, you can move in any direction at any speed. 8. When do I flip my card back to the "on the run" side? At the moment that you aren't walking back to your cell anymore. So, you can remain "caught" (and safe) as long as you are moving in the right direction. 9. When do I have to roll for noises again? At the end of the turn when you are back "on the run". 10. When do I risk being caught again? Once, you are back "on the run". Cache Moutons, alias Nicht zu fassen, has been awarded again. After Spiele hit in Austria and a nomination for the Kinderspiel des Jahres, the game has won the prestigious As d'or - Jeu de l'année Enfant. The gala evening took place in Cannes. This new award will surely give a strong boost to the game, and not only in France. On the picture above, you see from left to right : Jean-Christophe Girez, the French publisher from Gigamic, Albrecht Werstein, the boss of Zoch Spiele (German publisher) and myself. 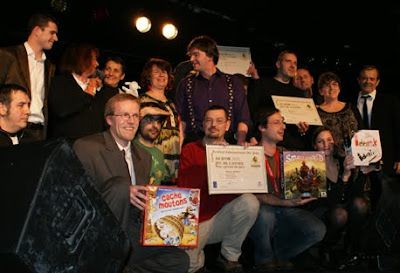 On the picture below, on the front row, you see all the winners together : myself, Philippe Keyaerts, winner of the Special Jury Prize with Smallworld and finally Emilie from Asmodee with Identik. 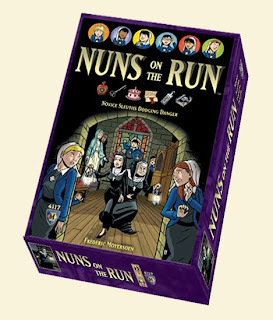 Here are three videos to promote the new game "Nuns on the Run". For the best effect, watch the trailer full screen with dimmed lights and at the highest quality level (480p instead of 360p). Enjoy! The first demos are very promising. Apparantly, people are intrigued by the theme of the game. On the picture, you see the abbess and prioress walking away after having detected and caught novice Theresa (me) in the chapel. 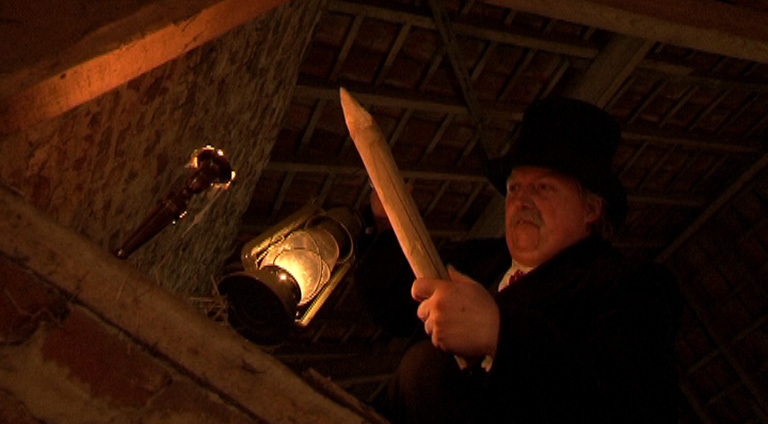 Cache Moutons, the French version of Nicht zu fassen has been nominated for the As d'or award. The game is still in competition against 9 other strong games, like Smallworld from my Belgian friend Philippe Keyaerts. This will be a tough decision for the jury and big suspense for me. 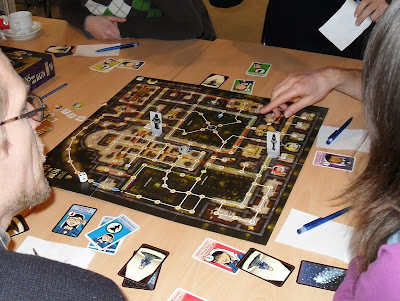 On March 11, Mayfair Games (USA) will release one of the games, which I cherish most. The title tells really where it is about. During the night, the new novices run around in the convent instead of sleeping in their cell. They want to fulfill a secret wish. The abbess "mother Benedicte" and prioress "mother Clara" start their round in order to capture the naughty girls. Soon more info about it.